The SEEC Stats Toolbox Seminars started with a BANG!!!! What a turn out? 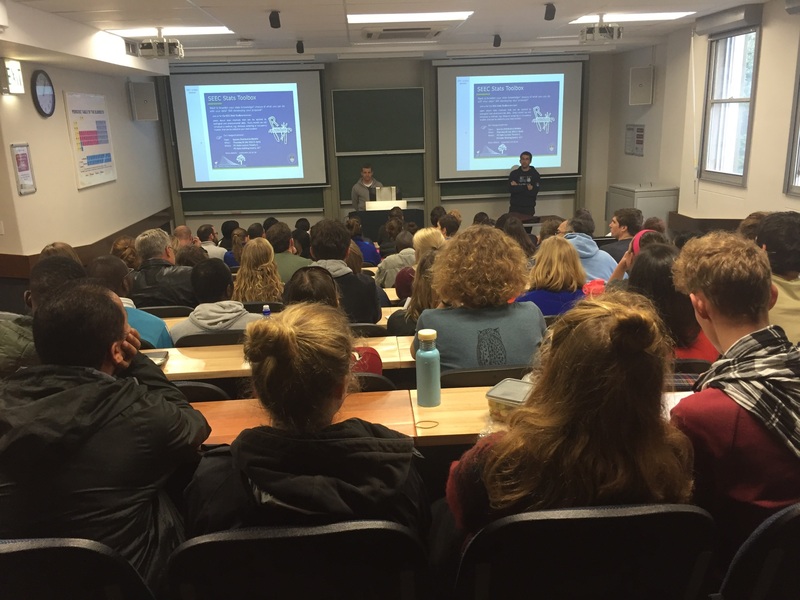 Dr Vernon Visser had a full house as he introduced Species Distribution Models to 92 enthusiastic students and researchers. They represented tertiary institutions, government departments, NGO’s and consulting companies. Prof Res Altwegg, Director of SEEC, welcomed the group and encouraged them to build up their basic stats skills in preparation for the exciting statistical methods that are being developed for ecologists and environmental scientists. We look forward to seeing you at the next SEEC Stats Toolbox Seminar on 25 August 2016, where Res Altwegg will be introducing Occupancy Models. Follow SEEC on Twitter, like us on Facebook, or join our mailing list if you want to be kept in the loop. The slides and R script for this seminar are now available here.